The first step—that’s what it takes. If you are planning to go see a friend or trek around the world, it all begins with that all-important first step. On the way to retrieve a shovel, I heard the raucous voices of two just-turned-10-year-old boys, as they chased each other around the barn. “That’s it,” I said to myself. Making those playful noises were William NeSmith and his cousin Henry Wilson. “Alan,” I said, “let’s plant this tree in celebration of William and Henry’s 10th birthdays, along with their Grandpa William Henry’s upcoming 70th birthday.” And just like that—as the boys were shoving dirt into the hole—we were planning to continue the live-oak-tree-planting tradition every Thanksgiving. 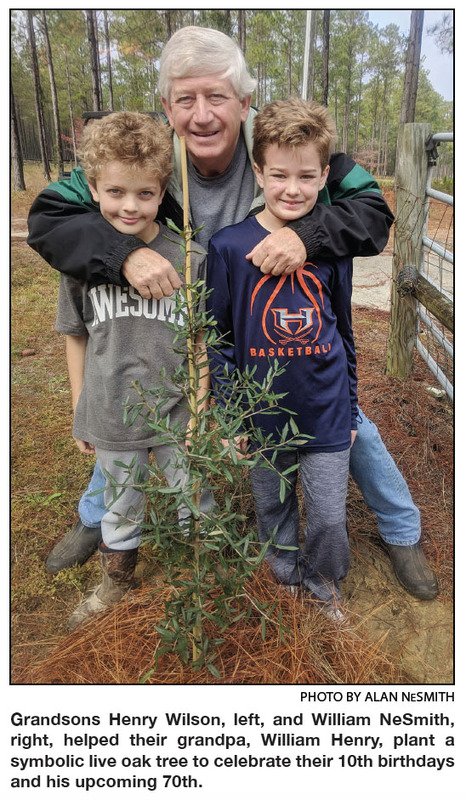 I’ve always admired the words of Nelson Henderson, who said, “The true meaning of life is to plant trees, under whose shade you do not expect to sit.” Live oaks are a trademark of our sandy Coastal Plain. They are also slow-growing, but I’m not in a hurry. I don’t care if I never get to sit under the shade of these infant trees. What’s more important is that I don’t rush and miss the joys of watching eight grandchildren blow out their birthday candles year after year. Unless I look in the mirror while I’m shaving and I notice my gray hair or wrinkles, I don’t think about being 70. Well, there’s one more time. When I go to Piggly Wiggly, the cashier tells me that I’m getting the “young-man” discount. I guess my possum-blond hair gives me away, but I am grateful for the friendly service and the savings. Still, I keep repeating what the late major-league hurler and philosopher Satchel Paige (1906-1982) once declared: “How old would you be if you didn’t know how old you was?” If age 60 is proclaimed to be the new 40, then 70 must be the new 50. Yep, Satchel, I feel about 50. That is, unless I’m swinging an ax, splitting firewood. When I’m 85, old age will be about 100. Alan’s younger brother, Eric, reminded me that in 15 years live oaks should be dropping acorns. So if I get to blow out 100 candles, I just might get to sit under the shade of a few of those 30 live oak trees. You inspired our family to take that all-important first step in a new tradition.